WOLVERHAMPTON got their 2015 campaign off to a spectacular start with Chris Harris eventually prevailing in the Banks’s Olympique Classic at Monmore Green. Supporters were treated to some blockbuster action after the long winter break, with “Bomber” putting in a vintage display to claim the top prize. Having prevailed in a scintillating battle with Freddie Lindgren in heat 10 to establish himself as the early frontrunner, he brilliantly blasted from third to first in heat 19 to climb to the top of the rostrum. 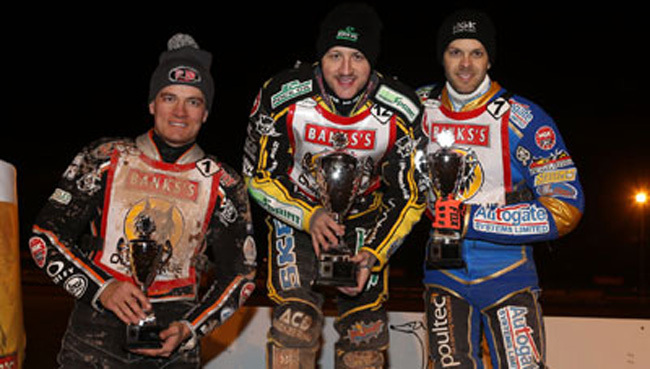 Whilst Harris emerged victorious, several riders battled for second place with Rory Schlein eventually claiming second place following a three-man run-off. With Sam Masters unfortunately prevented from taking his place due to engine problems after his final ride, Ricky Wells fought off Wolves colleague Freddie Lindgren to take third place and end as the top Wolves rider. Wells bagged 11 points following a determined showing, and he was delighted to get his season off to an encouraging start. Said Wells: “It was a really good way for me to start the season, I wish I could have got the win but to get on the podium is good. Swedish star Lindgren put in a solid showing on his long-awaited Monmore Green return, whilst Jacob Thorssell picked up where he left off in 2014 as he narrowly missed out on a rostrum spot. Defending Champion Peter Karlsson appeared well-set to challenge early on with wins in his opening two rides before ended with nine whilst Lewis Blackbird bagged seven including a classy win over Lindgren after he hit the front in heat 15. Debutant Tobiasz Musielak looked solid on his first appearance at his new home circuit, whilst youngster Josh Bates was always in the thick of the action despite failing to score. Wolves will kick-off their Elite League campaign as they travel to local rivals Coventry on Friday (7.30) before welcoming the Bees back to Monmore Green next Monday. Chris Harris 14 (1st), Rory Schlein 11 (2nd after run-off), Ricky Wells 11 (3rd), Fredrik Lindgren 11, Sam Masters 11, Jacob Thorssell 10 Peter Karlsson 9, Scott Nicholls 8, Lasse Bjerre 7,Lewis Blackbird 7, Kenneth Hansen 7, Aaron Summers 6, Tobiasz Musielak 5, David Howe 2, Jakub Jamrog 1, Josh Bates 0.